A Queensland family has chosen ZCell batteries to guarantee that their new home has electricity without any power bills in the largest Australian residential energy storage system to date for Redflow Limited. The Bates family’s six-battery, 60 kilowatt-hour (kWh) system ensures complete off-grid operation for their recently built home on a cattle and grain property, about 2.7 kilometres from mains power. 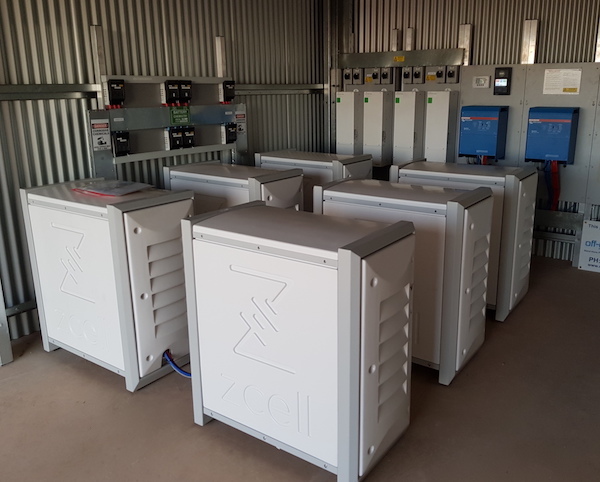 When Scott and Breeann Bates built their new house near Wallumbilla, they chose a ZCell-based energy storage system to give them uninterrupted power, grid-independence and no power bills rather than pay many thousands of dollars per kilometre to connect mains power to the house. ZCell batteries are produced by Redflow Limited, the ASX-listed company that has developed the world’s smallest zinc-bromine flow battery. The system was installed by Off-Grid Energy Australia. Breeann Bates said the ZCell-based system was living up to their expectations. “We are really impressed with it,” she said. “Scott wanted to be able to do everything on batteries that we could do on mains power and not compromise our way of living. It’s cold in the morning, so we’re running the heaters to keep our three kids warm, and we keep them on until the day warms up. shaking hands with Redflow CEO Richard AirdAustralian battery company Redflow Limited has started installing battery production equipment at its new factory in Thailand, putting it on track to commence initial operation by the end of this year. Through its Thai subsidiary, Redflow has signed a three-year lease on the 1500-square-metre building at the Hemaraj Chonburi Industrial Estate, part of the IEAT free trade zone, 110km southeast of Bangkok and 25km from the Laem Chabang deep sea container port. Redflow CEO Richard Aird recently visited Thailand to finalise the lease agreement with David Nadone, Chief Executive Officer and President of Hemaraj Land and Development Public Co Ltd, a subsidiary of WHA Corporation. Dean Calvert (left) with Bobby CollierAustralian small business IT specialist Calvert Technologies has expanded its capacity, especially in the real estate industry, after acquiring the assets of Adelaide-based technology company Vivid IT. Set up in 2013, Vivid IT had a customer base throughout Adelaide, from bricks-and-mortar retailers to several real estate agencies. Calvert has also recruited Vivid IT founder Bobby Collier as an account manager. As well as running his own company, Bobby’s technology experience includes positions in the defence industry with Raytheon and the Australian Air Warfare Destroyer Alliance. 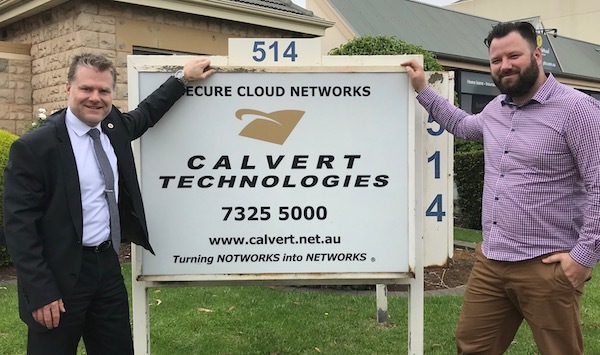 Calvert Technologies is an Adelaide-based Microsoft solutions company that services small business, corporate and government customers throughout Australia. With a headcount of 12, Calvert has clients including Group Training NT in Darwin, the Challenger Gold Mine, Adelaide Expo Hire, Mykra and LCS Landscapes. Calvert Technologies founder and managing director Dean Calvert said Vivid IT was a “great cultural fit” with his company. “Vivid IT was a smaller version of our company, providing managed services and core products such as Office 365 and security, so there’s a great alignment,” he said. “We decided to bring these two businesses together because collectively we can deliver better services to customers than we could separately. Bobby has an intimate product knowledge from his time on the tools with Vivid IT, plus a first-hand understanding of what makes businesses tick, so he’s passionate about delivering solutions to real-world business problems.